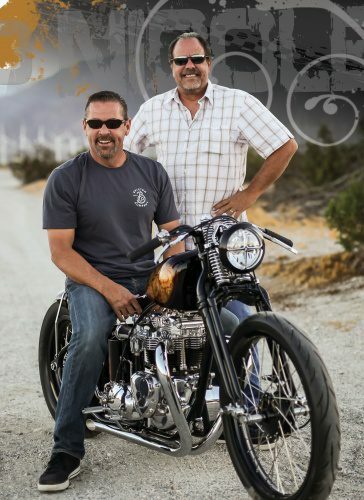 fter a lifetime of owning Harley-Davidson’s, Tom Day wanted to change directions. So, he decided to take on a Triumph. 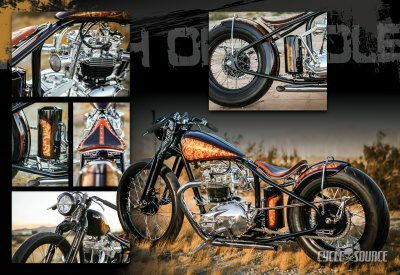 The project was meant to be just a weekend bar-hopper, but as these things go, about halfway through the design he decided to make it a full-blown custom. He started off on his own, buying parts off the shelf, but then fate stepped in, and he met David Bird of David Bird Hardtails. As they got to know one another David confessed to the fact that he had built every component of a bike hundreds of times but had never built a complete bike. Having met David during this build changed the project even more. It quickly changed from a one-man build to a two-man project. He couldn’t help but make this decision because as Tom said “His skill-set impressed me so much, I knew I wanted him a to leave his mark on this bike.” So they got started. The process took about nine months. They set a time frame because they decided to make it a goal to have it completed in time for the 2017 Hilly Killer Hoedown. And, of course, you could probably guess that the bike was buckled up and completed the DAY before the show. Somehow that happens with every build; give yourself a deadline, and you’re sure to barely make it. But regardless, they did it! Wanting this to be unlike any other bike they chose not to order parts off the shelf. Having David there to help, they hand created everything they could. The only parts they bought ready to roll and kept “as is” were the wheels, tires, and the headlight. The engine was a previously used engine, but the internals to that engine were all new. They chose to rebuild, why replace a good thing, when you can just make it new again! The frame was entirely hand built and custom made. Every bung on the bike was machined by hand. Anything else they did buy, such as the Cole Foster tank and the front end was chopped, cut and modified to make them one of a kind. To give credit where credit is due, besides the work David put in with the metal fab (the frame, tank, mounting brackets, pegs, and hard parts welding) the guys had plenty of help. David, Tom, and Dan Green created the concept and design together. 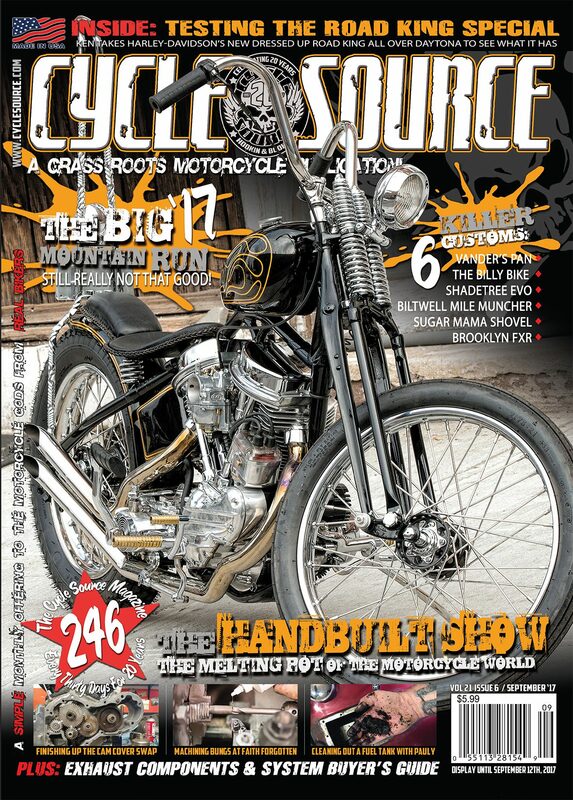 The Springer front end and front brake were done by Dan Patterson of Angry Monkey Motorcycles. The chrome and powder coat was done by Precision Plating out in Yucca Valley, CA. 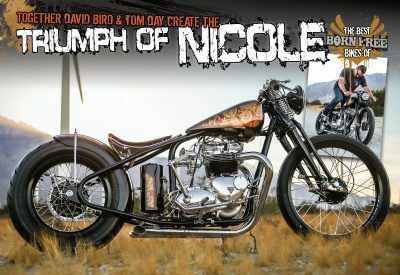 They chose Joel Meyer-England of 845 Motorcycles to handle the amazing paint job, and man, it is spectacular! As for the engine, they had the help of DTM Industries who did the work on the Intake Cam, Exhaust Cam, Kibblewhite Valves, Beehive Single Valve Springs (with special lower cups and Titanium tops and Kibblewhite keepers), the EDCO Full flute valve job and the full floating crankshaft bearings. So far Tom and David have had it in quite a few shows, some they entered just for display like Hippy Killer and Born Free, and others they submitted it into the event. At the Progressive International Motorcycle Show in Long Beach, CA the guys took home 1st place in both “Best in Class” for the Modified Retro Division, and the People’s Choice “Best in Show”! They also got 1st place at the Rockabilly Extravaganza and 2nd place at the Exile Cycle’s Rider Roundup at the Ranch. Next up for this duo will be the IMS show in Chicago, IL. “Working with David Bird was such a great experience. 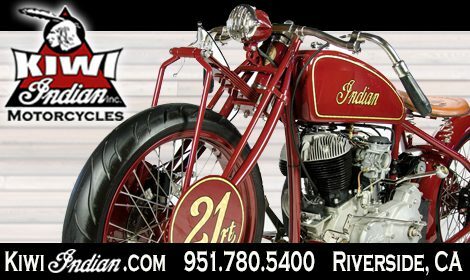 He helped the process go very smooth, and his craftsmanship is second to none!” In fact, they had so much fun building this bike together that after the Chicago IMS show they plan to start another build! As for this one, in between events, it will stay resting in Tom’s living room where it spends most of its pretty life. I don’t know about you, but after seeing what these two can do when they put their talents to the test, I can’t wait to see what the next build brings. Well done gentlemen, well done. This entry was posted in Feature Bikes and tagged Back Issue, custom bikes, Cycle Source, Cycle Source Magazine, Featreu Bike, Spetember 2018, Triumph, Triumph Of Nicole, Triumph T-140. Bookmark the permalink.